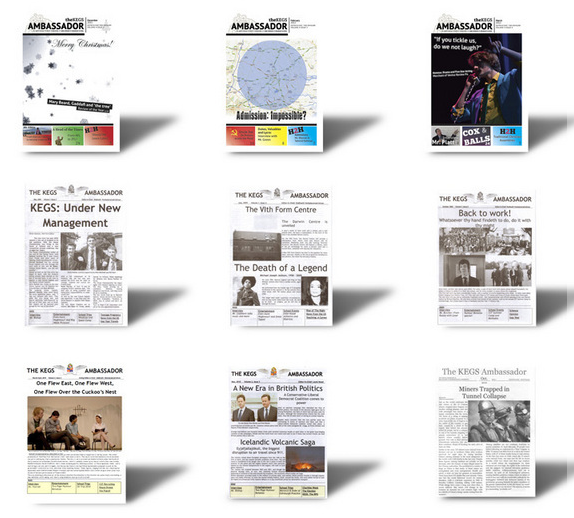 The KEGS Ambassador is the Independent Student Newspaper at my school. A full back catalogue can be found here. Arriving at KEGS I was surprised to find that the students didn’t run their own newspaper given that they obviously had the capability required. The English Department does a lot of work with creative and factual writing and all Year 9 students get involved in the Guardian NewsDay initiative. We have an annual school magazine, The Chelmsfordian, that a team of students put together with staff; this is the official school round-up of the year’s events. We also have an annual ‘Rag Mag’ for our Charities Week; this is always very funny but is basically the watered-down outcome from heavy censorship of a libelous/scandalous original. However, I felt that we needed to create an additional vehicle for students to express their views, engage in debate and to produce writing that would entertain and inform – on their terms. My conviction has always been that if we are serious about ‘Student Voice’ then we need to give them the opportunity to express it whilst also making them take responsibility; from the outset the goal was to allow and enable students to gain full independence, so that they retain full editorial control. Now entering its fifth year, The KEGS Ambassador has become a popular, embedded feature of school life. When every issue comes out, there is a frenzy of mass-reading in the canteen and staffroom and the paper becomes the talking point for quite some time. I look forward to each issue, trusting that it will be of high quality and that the students will have set their own boundaries appropriately. However, it didn’t happen overnight. From the culture that supported two opposite poles (Rag Mag vs School Magazine) the middle path needed to evolve. A competition was launched to design a prototype newspaper with a name and a flavour of the content. Students commented and voted on the entries; staff had input too at this point and The KEGS Ambassador was chosen. We deliberately went for something that would stand the test of time; that might still be around in 100 years time, not something cool and gimmicky that would chop and change. Also, the name chimed with our goal to be a more global, outward-looking school. We agreed on a formula: half-termly issues, 200 copies, full issue on display board in the foyer, costs met by the school, 24-30 page A4 booklet style, printed in-house by Reprographics Technician. These elements are always subject to review; there could be more editions but no fewer. The students set up their own twitter account @KEGS_Ambassador and they use this to publicise their work and to provide access to the back catalogue. They also developed the archive using Google docs. This is totally within their control. Over the years, my role has been to ensure that the necessary trust relationship exists with the Editor. I meet them a few times early in their tenure to talk through the process and offer support as required. We learned an important lesson early on. If I took on the role of ultimate censor, giving final approval, the Editor assumed that I would spot anything dodgy and he would defer to me. In other words, he would pull back from taking full responsibility. This led to a couple of difficult situations – notably on the ‘Jokes Page’. Failure on my part to read a couple of jokes properly, led to the publication of some pretty offensive material. However, the solution was not to impose more control but to remove it all together. From then, I have simply said: You know there are boundaries, you are responsible. If you publish something you can’t defend, you’ll have to face the consequences. If you can defend it, publish it. This creates a self-preservation mechanism; they want their newspaper to thrive and they don’t want to risk their freedom for the sake of a naff joke. So far it is has worked quite well. In truth, 99% of the content is uncontroversial. However our editorial control approach was tested when the Ambassador featured a re-hash of some Prince Phillip gaffes. Sure enough some of HRH’s racist comments caused offence. This led to a debate about whether re-cycling someone else’s racism as humour, even if presented in an ironic ‘post-modern’ style, was justifiable. I was asked some difficult questions by a couple of parents. Was I condoning racism used as humour? No, I said, and explained the context – that they were trying to say how absurd his racism is. They’d misjudged it but their intent was clear. Anyway… the students learned a lot from PrincePhillipGate! The tagline ‘Official Newspaper of KEGS’ has since been replaced with ‘The Independent Student Newspaper’ of KEGS. I encourage parents, Governors and teachers to give feedback directly to the newspaper and to take up any gripes they might have with them. This is important. If we want them to learn about journalistic integrity and so on, they need to deal directly with their readers. I defend the position on the basis that KEGS is the kind of school where students have real responsibility; it isn’t merely tokenistic. That includes the freedom to cause offence… they need to learn where the boundaries lie through real experience, not simply because the school protects them. There has been a bit of see-saw in terms of style along the axis from frivolity to sobriety. Some issues have been too lightweight but actually if anything there has been a tendency to be too serious; too worthy; too dry. However, this is where teachers have been useful. We are always giving them feedback. Mostly it has been to ‘lighten up’! The most recent series was especially good, achieving a great balance with current affairs, Head to Head debates, light-hearted interviews, reviews of universities, films and books, some sport, a regular mickey-take of my educational ideas and assembly message (A Head of The Times) and much, much more. An on-going debate amongst students is how much actual news to put in the paper. Discussing current affairs is one thing; but trying to report news is different…. I leave them to thrash that out. Ultimately the Editor has to decide and this requires a fair degree of assertiveness at times. So, it can be done. 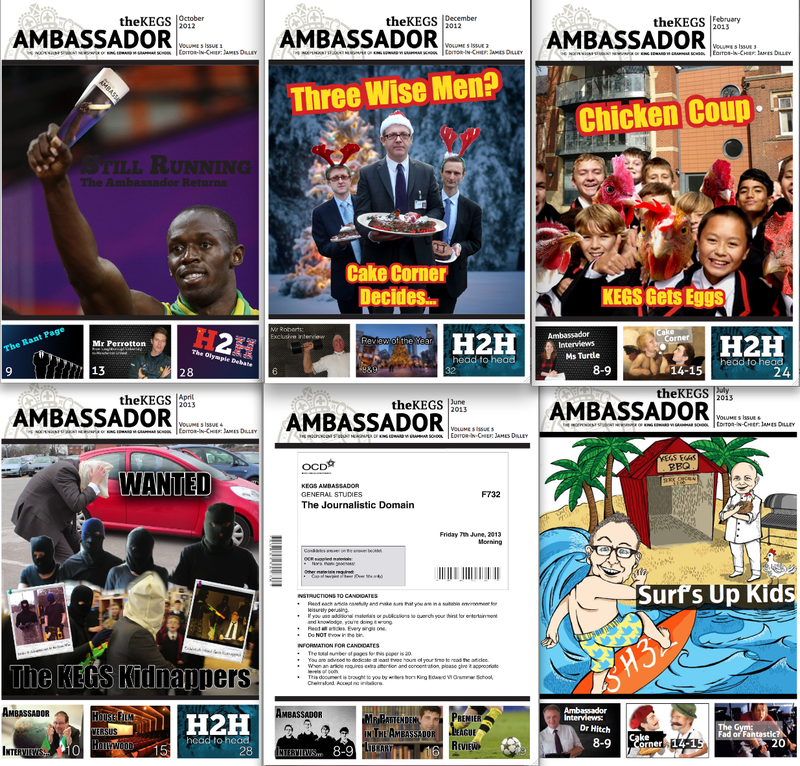 This year we have more people than ever wanting to contribute and the new editor has a great vision for what the KEGS Ambassador can be. 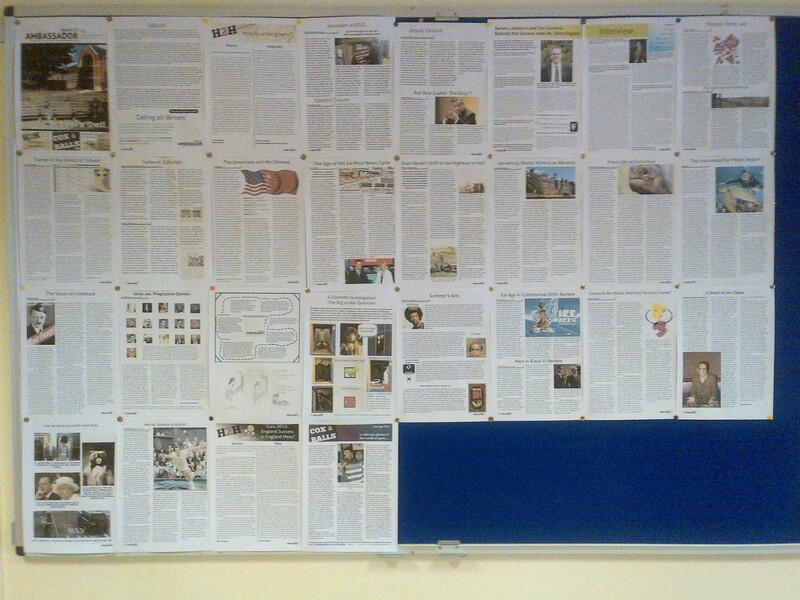 We are all eagerly anticipating the first issue. Am I nervous? Only slightly! But more than anything I hope that the student readers will feel that the newspaper is a genuine expression of their thoughts, ideas and the general KEGS Spirit that they all love so much. An issue on display for passing readers. Hi there, thank you so much for your informative article! I’m looking at starting a student newspaper at my prep school and I must say I’m very nervous about it! I was going to be the editor (this tripling my work load!) but your approach whereby the students take full responsibility has made me reconsider! Would you mind me asking what desktop publishing program you use for the layout? Also, do you suggest a competition for both the name of the newspaper and the content? Hi Nikki. To be honest I don’t know what they use but I could find out. Publisher I suspect. A competition for both separately would be good so you can choose both.. you might get good content with a dodgy title! The software is Adobe inDesign apparently. I can put you in touch with the student designer if you want. I’m sure he’d love to help. I contacted you on Twitter re setting up a school newspaper. I don’t want to take up too much of your time, but would really appreciate a short conversation about getting started if possible. My main concern is that although I’d very much like to follow your model of full-student voice and responsibility, I’m unsure as to how far the school itself will allow us to do so. I accept the concern you highlighted in your blog, that being an ultimate censor would mean the editor relying on that censorship too much. You can contact me through the email address I’ve left in the compulsory fields to comment, I’d guess?